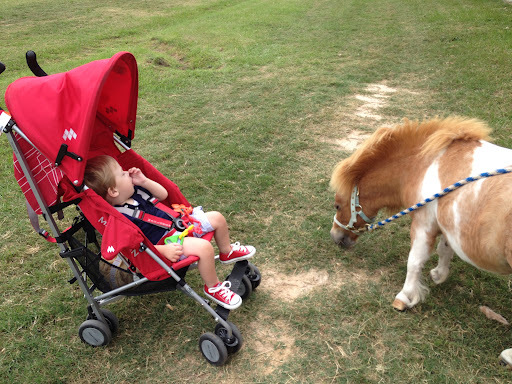 Today we went to a friend’s barn to visit her horses and Grayson LOVED it. I think he mostly loved being outside in the breeze, but he babbled and laughed the entire time we were there (during naptime!). 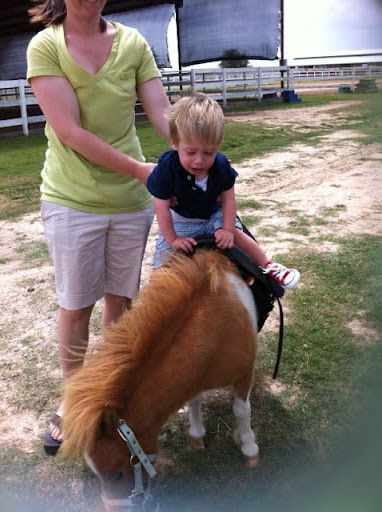 We are considering hippotherapy (horses) for Grayson at some point, and today made me even more excited about it. This is Sophie, G’s new pal. 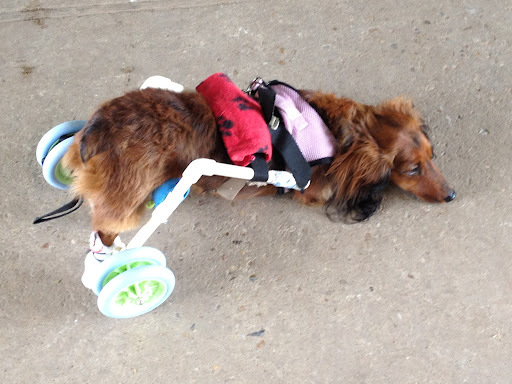 Sophie is disabled too, so they have a special connection. 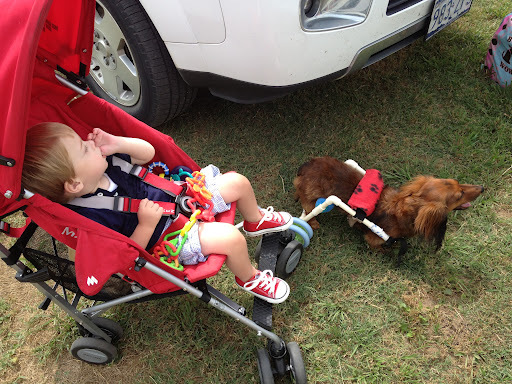 They took each other for a walk- apparently it is more fun to hold the leash in one’s mouth. Meeting Spirit, the miniature horse. Perfect size for our little guy. 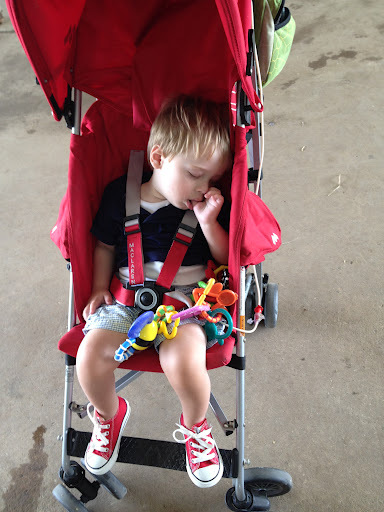 By the time it was time to ride, Grayson was really tired and was kind of over it all. 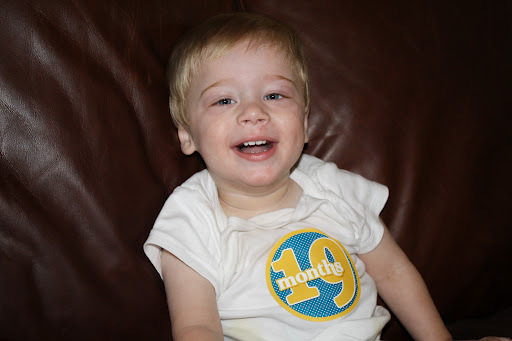 It’s been nearly a week since Grayson got his diagnosis. I am so thankful for the abundant love and support our little family has received. We know people care about and are praying for Grayson around the country (and even the world) and are so grateful. I’ve cried almost every day since Friday. Since we started this journey, I really haven’t cried much- I guess I feel like the majority of time I have to keep it together for him- if I fall apart, this whole operation falls apart. But the reality of the situation has been sinking in- my son has a chronic disease that will affect him his entire life. His life will be very, very different than the life I imagined for my child, and as a result, our family will be very different as well. No, different isn’t necessarily bad, but this disease isn’t “good” either. 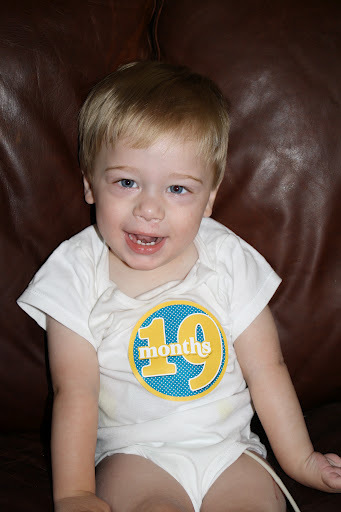 Having a 19 month old who doesn’t eat, crawl (yet! ), sit up, walk, or talk is hard- it just is. I saw my counselor on Monday and she helped me work through my fears, especially the fear that Grayson has Leighs. But the reality is we don’t have any idea which type of Mito Grayson has, and won’t know for at least another few months, if ever. So I’m not going to be in denial about it, but also can’t let fear take over my life. I have too much to live for and enjoy right now, today. My little guy has truly been amazing me the past few days. The Mito specialist doubled the dose of CoQ10 prescribed by our neurologist, as well as increased the dosages of his other supplements. I’d been giving him too little of the CoQ10 because I converted the milligrams to milliliters wrong (yes, I’m a former math teacher, shame on me). So actually now he’s getting 10 TIMES the amount he has been the past few months. Well, it’s doing it’s job, apparently. Grayson spent a good part of today in this position. And he has figured out he can MOVE himself by picking his hands up and turning his body. CoQ10, where have you been all my life? 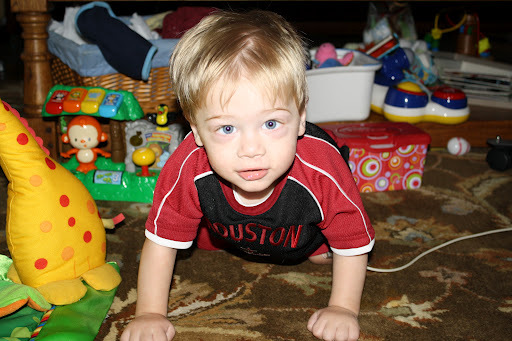 Sadly, he got his first “crawling” injury a few minutes after I snapped this picture- a busted lip on the wood floor. Poor little tough guy. The most amazing thing today (and I didn’t have my camera, grr) was when I went into his room when he woke up from his nap. I got right up close to him so he could see me, and he got a big grin on his face, pushed himself up and grabbed the crib railing! I seriously almost fell over. 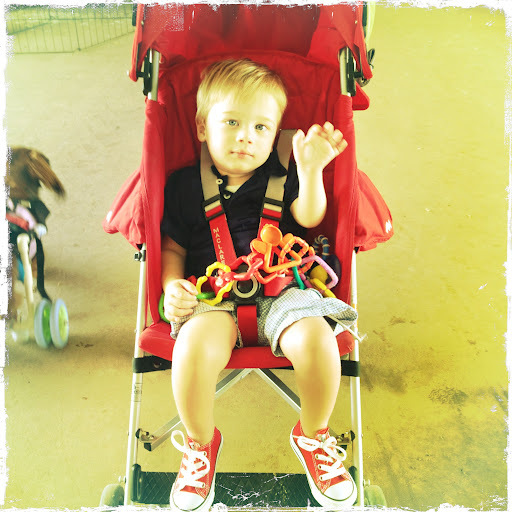 I’m realizing there is a good thing about having a child with developmental delays, as I’ve been told. I truly do marvel and appreciate the “inchstones”. Any tiny bit of progress is cause for celebration (or a slobbery kiss from Izzy). 19 Months! Counting in months, you are now closer to 2 than you are 1- wow. I can’t believe how time is flying. Developmentally, this has been a big month for you. 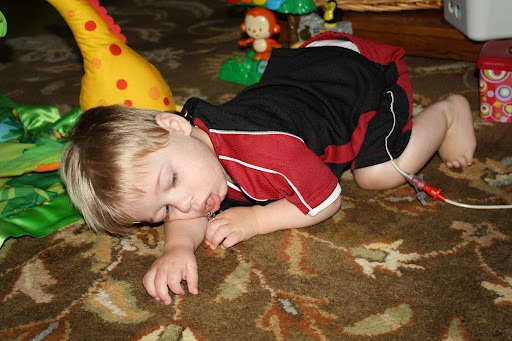 You desperately want to be on the move and are constantly getting yourself in the crawling position, rocking back and forth. I just know that one of these days I’m going to look up and you will be across the room- I can’t wait for that moment! I love how you are so proud of yourself- you should be! You are also FINALLY getting some more teeth- I was starting to think the eight you have were all you were going to get- ha! You have four coming in right now- that’s right, four teeth all at the same time. Oy. Thankfully, it hasn’t been too bad- you poor thing, having so many other issues, teething really isn’t that big a deal, is it? You’ve been having some rough times the last few weeks- lots of little seizures and pain. When I hold you and you are screaming in pain, your little feet shaking, I just feel helpless and so, so, sad. I am so sorry for all you have to go through, little man, and I pray constantly that your body will give you some peace. You continue to grow, and in my opinion, just get cuter and cuter every day. Everywhere we go, people comment on your adorable-ness and your gorgeous blue eyes. You now weigh almost 22 pounds and you look good. I think once our stash of size 3 diapers runs out, we are going to move on to size 4! 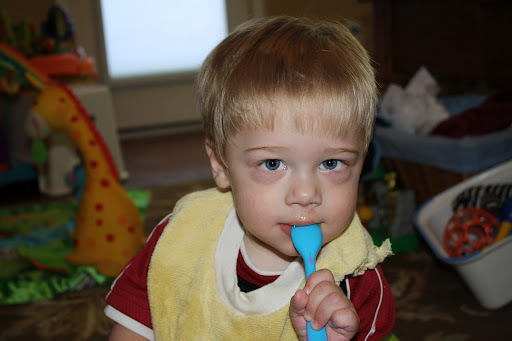 We are working hard on teaching you to eat by mouth again, and your are starting to enjoy the taste of food. You will accept almost anything in your mouth- usually after tasting it, you spit it out, but at least you are enjoying different tastes and textures. You continue to have an obsession with Veggie Tales music- we play their Silly Songs album over and over, and I love to watch the grin you get on your face at your favorite parts. Listening to the Belly Button Song- you love it! This coming month, we have a few doctors appointments and lots of therapy, but also some fun things planned. While the weather is still bearable, we’ll be taking walks and going to the swings whenever we can. You were also invited to a pool party with the families from your new school, which should be super fun! I love you so much, sweet boy, and am so proud of you. You inspire me every single day. The following is an email I wrote today with details about what’s going on with Grayson. 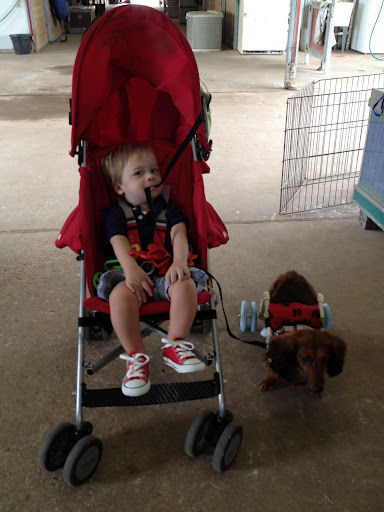 We had our first appointment with the Mitochondrial Disease specialist Friday morning. 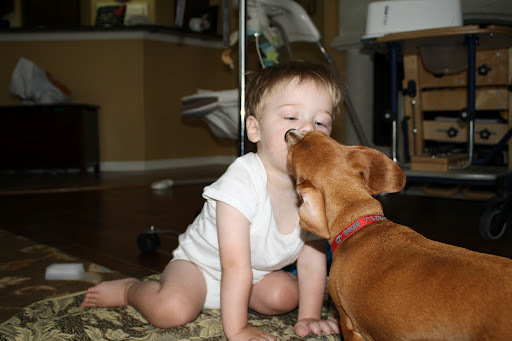 She did diagnose Grayson with Mito based on his muscle biopsy results and recurrent abnormal lab results. There are many different types of Mito, and we don’t know which type he has yet- hopefully the genetic testing will show the affected gene. We will get those results late June. 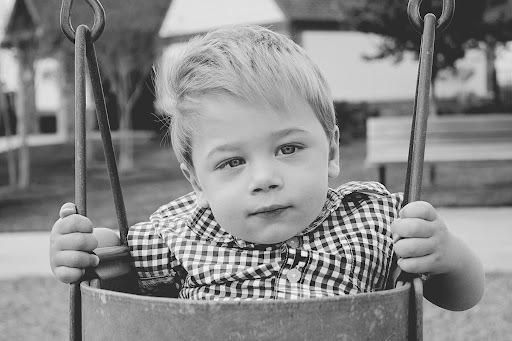 The specialist does want to test Grayson for a specific type of Mito called Leighs Disease. The prognosis of kids with Leighs is very poor- most of them don’t survive longer than a few years. Our neurologist ran a blood test for Leighs a few months ago, and we thought we had ruled it out. We did rule out that it couldn’t have come directly from me, but it could be a combination of both me and Ryan, or could occur spontaneously. The specialist is concerned for Leighs because Grayson’s symptoms presented so early in life and his developmental delays are so severe. Leighs Disease causes lesions to form on the brain, so the doctor ordered an MRI. She also ordered a list of other tests: spinal tap, EKG/Echo, a sleep study, and more bloodwork. We were able to get some of the blood taken yesterday, but Grayson’s veins weren’t cooperating so I’ll have to take him back Monday to get the rest. She also wants us to see an immunologist and ENT, and has increased the dosage on his supplements and added a few more. We asked the doctor her opinion on whether Grayson will ever walk and talk. She says because he is doing a lot of good things right now (he bears weight on his legs and has started getting into the crawling position) he may walk someday, probably with assistance from a walker of some sort. She doesn’t think he’ll ever communicate like we do, but may learn to say a few words. Of course we know doctors don’t know everything, and we won’t put any limitations on what God can do for our child. The hardest part of all this is it will most likely be a few months before we find out if he has this disease or not because of scheduling all the tests and waiting for results. 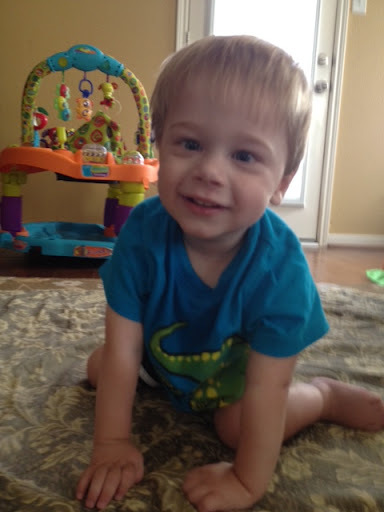 First, we want to boldly pray that Grayson does NOT have Leighs Disease. We want Grayson to have a long, full life. Pray that the genetic testing we are having run right now shows the gene that is defective. This is important for several reasons. 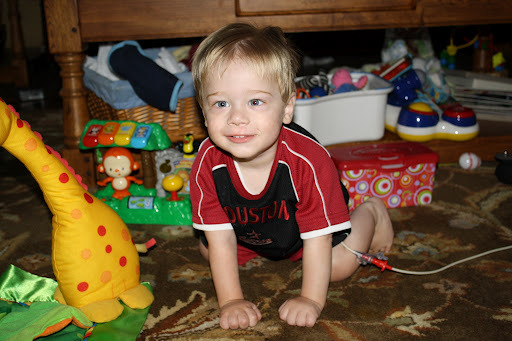 One, it will give us prognosis for Grayson as well as possible treatment options. Two, if we know the gene that is defective, Ryan and I can be tested to see what our options are for future kids. Pray that Grayson’s body gives him some peace. He’s been having a lot of seizure activity/clonus lately and has been waking up at night crying in pain. He is also sick right now- we are praying it doesn’t turn into anything more serious- G doesn’t get sick a lot, but when he does, it takes him forever to recover. Pray that Grayson continues to progress- he is doing some great things right now- getting a lot stronger and getting into the crawling position. 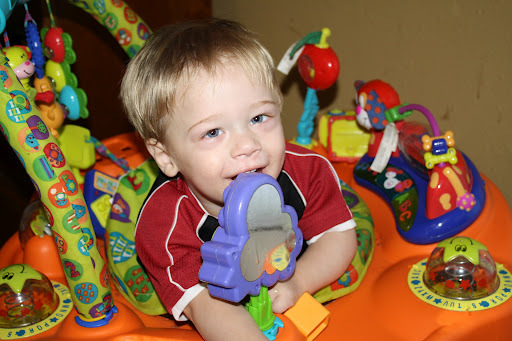 He is also working with a new OT and is working hard at learning to eat by mouth. Thank you so much for all you have done for us and for your prayers. We are so blessed to know each of you and to call you our family. It’s been a really long, hard day. Grayson was officially diagnosed with Mitochondrial Disease this morning. Although I am relieved and glad to finally have a diagnosis, there are a lot of emotions, fears, and sadness that I am processing. I’m not really ready to write about it in detail right now, and a glass of wine and hot bath are calling my name. 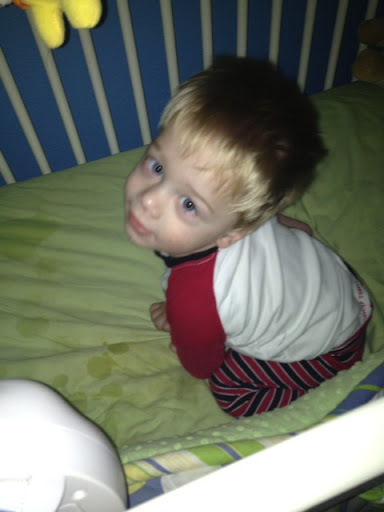 But I wanted to leave you with a picture of our little miracle boy- this is how I found him in his crib the other day. Wow. I think he’s going to far exceed a lot of people’s expectations. This week, there’s been a lot of controversy and discussion in the feeding tube world over the K-E Diet. The article claims that brides are using this diet to quickly lose up to 20 pounds in 10 days. This diet involves having an NG tube placed for 10 days, and the women are on continuous feeds for the duration. Monday on the Today Show, Kathie Lee and Hoda did a segment on the diet, and basically made fun of it. You can find the clip here (it starts at 5:10). There are many, many tubie moms who are outraged by the diet itself and KL and H’s coverage of it. They have posted pictures of their tube fed kids on the Today Show FB wall and written letters to NBC demanding an apology. And I get it. I understand why they are upset. They look at brides using a device to lose weight that literally keeps our kids ALIVE as disrespectful and demeaning. And then two talk show hosts laugh about feeding tubes and people carrying around a bag of formula all day. But me personally, I’m not that upset. I am a little annoyed at KL and H’s attitude about the bag- because yes, that’s what we do. Anytime we leave the house, Grayson’s backpack with his pump and bag of formula come with us. When we are at home, he’s attached to an IV pole. It’s really not that big of a deal- yes, it’s annoying, but we’re used to it. And I understand that people have a negative reaction to seeing a tube threaded down a person’s nose into her stomach. I had to watch that procedure 4 or 5 times when Grayson had his NG, and it was horrific. He screamed bloody murder and there would always be a little bit of blood come up in the tube when they inserted it. He choked and gagged and screamed, and then once it was in, we had to tape it to his face. The one time my mom and I tried to put the tube in ourselves, instead of going into his stomach, it came out his mouth. Horrible. Honestly, I don’t understand why people are so shocked that women are doing this. It’s just another crash diet. And let’s face it, when you are a bride, there’s an element of vanity there. I know I wanted to look my very best on my wedding day, just like every other bride. A LOT of brides do extreme diets or exercise programs to fit into their wedding dresses- no, it’s not healthy, but neither is eating grapefruit for 20 days straight or taking diet pills. And there’s liposuction, which to me is a lot more scary than having a feeding tube for a few weeks. And I’m not saying this diet is right or good, but I don’t think the women who are doing this are insulting our kids. Do I think Kathie Lee and Hoda should apologize? Yes. I think the segment did nothing to educate the public about the true medical purpose of feeding tubes, what they look like, and how they work. And in general, people are clueless about tubes (and I am putting myself in that category prior to 6 months ago). Last Saturday, Grayson and I were in line to order at a restaurant and a woman very politely asked me if Grayson’s backpack/tube was a Camelbak. Of course inside I am hysterically laughing and thinking really? but I very politely “educated” her on feeding tubes. I heard another story the other day from a friend who was rudely told to take her daughter to the bathroom when she was tube feeding her in a restaurant. Turns out, the rude person thought she was being catheterized, but when my friend explained what she was actually doing, they had a nice conversation. I certainly think there is a time to be outraged, especially when things in the media hurt our kids. But I also think a little compassion for ignorance can go a long way. And just because I thought this was interesting, here’s another Today Show report on medical devices being used in unconventional ways. This one just makes me roll my eyes. I was waiting to see if there would be any controversy on it- so far, I haven’t heard any.